John Kinabrew, an LDWF aquatic volunteer instructor teaches kids the basics of casting and knot tying at Lake Pontchartrain..
Baton Rouge, La. — The Louisiana Wildlife and Fisheries Foundation has received a $100,000 grant from the Irene W. and C.B. Pennington Foundation which the organization will use to assist the Louisiana Department of Wildlife and Fisheries to train volunteer instructors to teach youth about fishing and conservation. 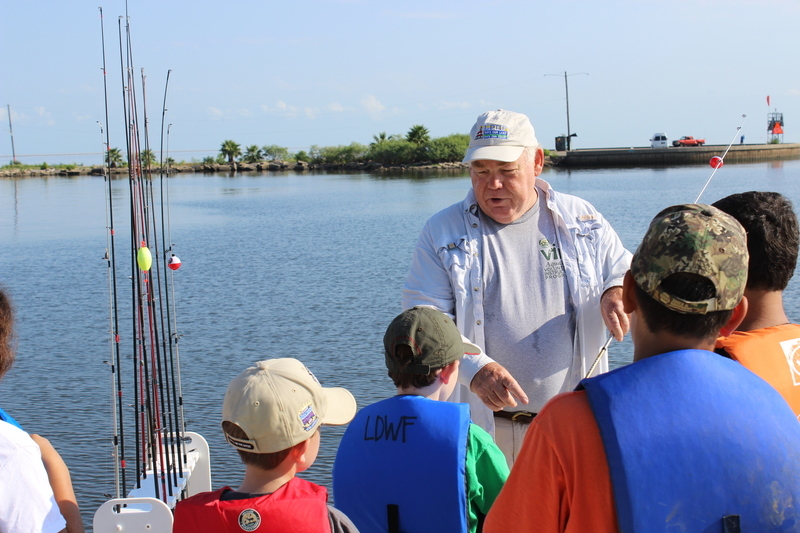 The LWFF’s grant will focus on the LDWF’s Aquatic Volunteer Instructor Program (VIP) which will use the grant assistance to train some 60 instructors to help the agency reach a larger number of youth this year. The LWFF is a nonprofit that helps fund and generate support for LDWF programs. Persons interested in becoming a volunteer instructor should visit http://www.wlf.louisiana.gov/ldwf-volunteer-programs or contact Alayna McGarry at amcgarry@wlf.la.gov .